As a child, nothing was more exciting than “counting down” to Christmas. Over the years, I had a variety of Advent Calendars, some containing chocolates, others with just pictures that were revealed each day, until Christmas. Most Christmas mornings I would forget to open the final door of those calendars that had 25 openings, because…there was a stocking waiting for me, filled with goodies. when not in use. 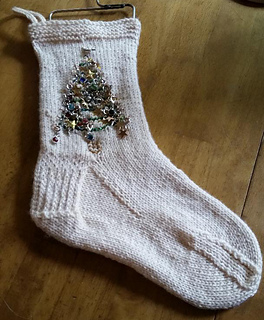 This stocking is knit top down, with a traditional sock heel flap, gusset, and toe. 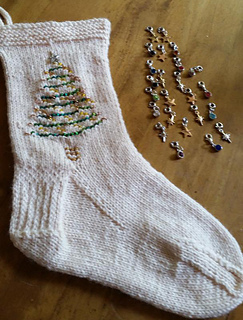 Stitch Markers, one unique for start of round, large eyed tapestry needle. 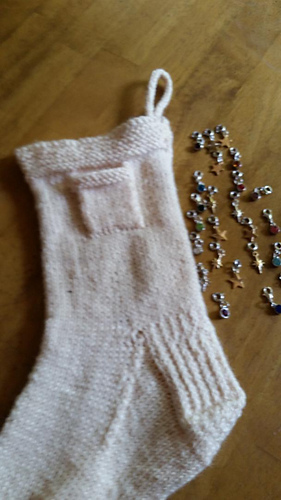 1 larger star or snowflake charm. 24 lobster claw or spring ring clasps. Size 6/0 green glass seed beads. Size 6/0 yellow glass seed beads. 9 Size 6/0 brown glass seed beads. Beads are applied using a small crochet hook. 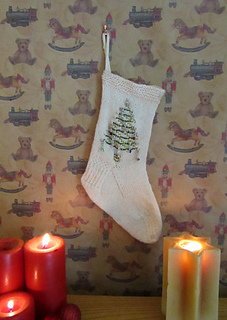 This pattern is part of the the Stress Free Christmas KAL. Please join in the fun, here!